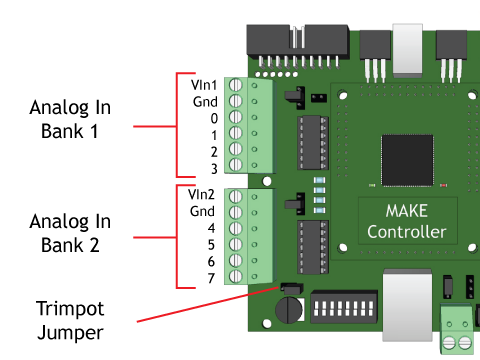 In AnalogInput (or any other widget used with the Make), the controllerIP setting to use for the Make’s IP address is 192.168.0.200. This works with the older, larger Make Controller. For the newer, smaller Make Controller, the controllerIP address should probably be set to 192.168.0.201. So if you find AnalogInput is not communicating with the Make Controller, try setting the controllerIP to 192.168.0.201. In the widget, also set the controllerPort parameter to “10000”, which is the port the Make communicates on. 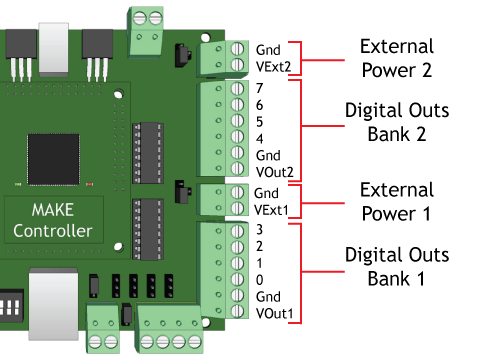 attach the sensors and effectors before you power up the microcontroller. This reduces the chance that you accidentally short out the microcontroller by crossing wires while you hook things up. NOTE: Once you’ve used an input with the AnlogIn widget, the DigitalIn widget won’t work anymore. To fix this, just power off the Make Controller and power it up again. Then the DigitalIn will work. be sure you attach the sensor ground (black), power (red), and signal (white) to the corresponding terminal positions. If you mismatch the connections, you may short out the microcontroller. switches and other digital sensors typically have only 2 wires, power and signal. Some microcontrollers (such as the Arduino) require three wires with a pull-up resistor. The Make Controller does not need this, and you can hook a switch up without any extra wiring or resistors. by default, the 8th (number 7) input is wired to the trimpot on the board via a jumper. this makes it easy to test the controller without hooking up any external parts. to hook up a knob (potentiometer) to the first input port, using Analog In Bank 1, hook the red power wire to the VIn1, hook the black ground wire to Gnd, and hook the white/yellow signal wire to port 0. LEDs, relays, and other on/off effectors must be attached to the digital outputs. Usually, these have just two connections, a ground and signal. Do not attach to the power (Vout) connector. 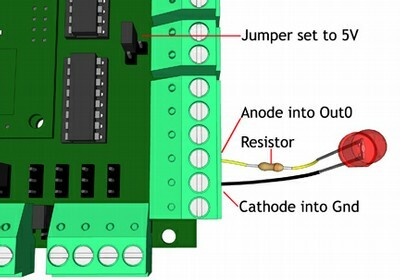 To connect an LED to the first port, hook the ground wire to the Gnd connector in Bank 1, as shown below. 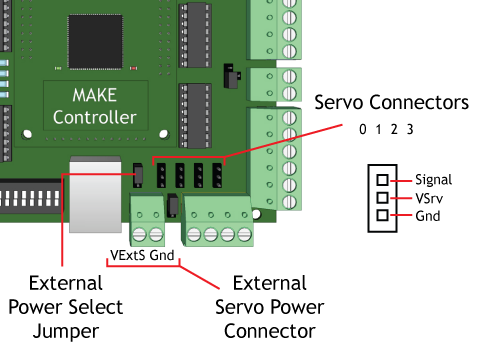 Servo motors should be attached to the servo outputs, with the ground brown or black wire at the towards the edge of the microcontroller, where GND is printed. plug the USB and Ethernet cables into the computer and Make Controller. For simple applications, the USB cable provides power to the controller. When you need more power, you can use a battery or wall plug power supply instead of the USB cable. once the power is on, the red LED should go on and the small green LED should blink. if the lights do not come on when you plug the power in, immediately unplug the power. This may indicate that there is a short somewhere, or that you’ve plugged the power in backwards. Check your connections, fix any problems, and try again. Of course, no lights may also mean that the USB cable is not connected, or the batteries are dead.